My days of living on Cape Cod you always heard the phrase the unofficial start of summer on memorial day weekend. Most think of the cape with hot lazy days on the beach or sailing across the bay for some ice cream in West Falmouth. Most forget that Memorial Day can be kind of cold and I always suggest sweatshirts. Well today is not disappointing here in Milford it is a raw 51 degree and they are forecasting rain. The Milford Facebook page for Milford community is a buzz with does anyone know it the parade is rain or shine? We moved into Yale Drive many moons ago and this was our welcome to Milford event even ran into the past owners of the house. Now I work down town and get a birds eye view of most Milford parades and fondly remember walking along side the band with water bottle in hand ready to rescue a thirsty member. Anyway before I get to nostalgic or totally drawn into the sound of the waves on the beach, back to my point. Lyn had a hankering for some turkey and we found a bone in breast at the store so I decided to BBQ it and welcome summer to our deck. We had a 9 pound bone in full turkey breast. 1/2 cup granulated sugar or brown sugar. 2 quarts of butter milk – I always have powdered on hand great for chicken marinade makes so moist. Add 4 cups or so of ice cubes to bring to room temperature. pour the buttermilk brine over turkey and squeeze out as much air as you can. Place in refrigerator for 24 hours – HINT clear a space before so you don’t get surprised and start to use choice works while balancing a 15 pound pot. This is from past experience. 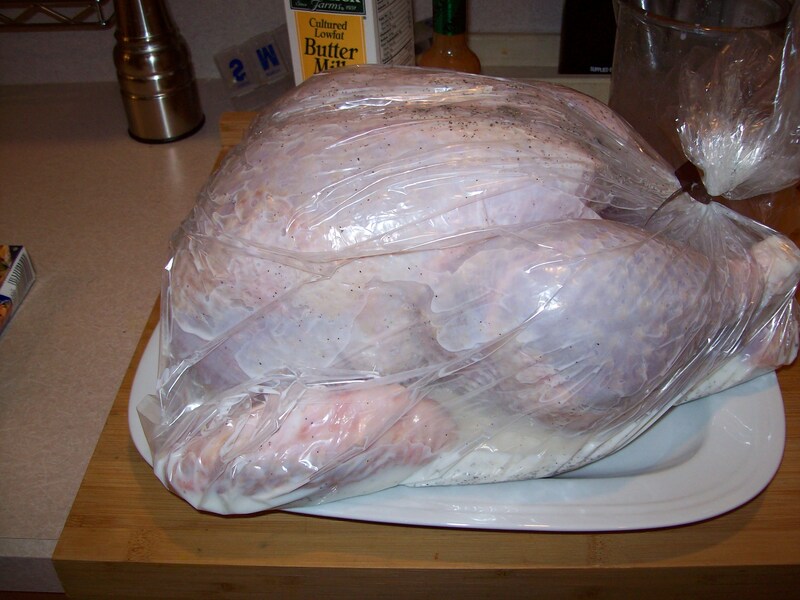 Rinse the turkey and dry with paper towel and let come to room temperature. I always have a basic brown sugar paprika rub on hand since I tend to make a bib batch. You can use your favorite home made or store bought. I like to place a little butter under the skin. Rub turkey with olive oil and then rub the whole turkey with your rub. I have already started the grill first by taking a good couple of handfuls of the wood chips and putting in a loosely sealed aluminium foil pouch. I did not turn the heat on the side with the wood chips until I placed the turkey in. Right, the turkey has been put on a rack in pan with water at ready to put in once on grill. Place the turkey on the non heat side and put water in the pan. At this point I have turned the far side to high and the middle and right side to no flame. I also have place a meat thermometer in to watch the temp. I’m going to use indirect heat method. Close the lid, watch the temp so it does not go to high, mine stayed around 250-300. I waited an hour by this time the chips were long smoked out and then turned so the other side is facing the heat. Cooked until 165 or there about. I usually don’t like to use those plastic pop up guides but it was there and what the heck. it popped before the temp said 165 but I grabbed my instant thermometer and it agreed to time for a new battery for the old one. There are only 2 of us so take out the food saver and open the freezer door. OK GOOGLE stop the sounds of the ocean time to go to Wrentham Outlet Mall. I think we’ll do a buttermilk turkey but try it as a brine this year. got to make space in frig for 24 to 36 hour bath. The information that follows includes general guidelines for roasting a turkey. If you are using a turkey recipe from one of our Thanksgiving menus, follow the specific techniques described in the recipe. To ensure ample servings for Thanksgiving dinner as well as generous leftovers, allow for 1 to 1 1/4 lb. of turkey per person. For best results, roast your turkey on a wire rack in an open roasting pan. Because of the turkey’s weight, a sturdy pan with good handles is recommended. If you use a foil roasting pan, double it for extra strength and take special care when transferring it into and out of the oven. Remove the turkey from the refrigerator 1 hour before roasting. Do not leave the turkey at room temperature longer than 1 hour. The times listed below are calculated for an unstuffed turkey brought to room temperature and roasted at 400°F, breast side down, for the first 45 minutes, then turned breast side up and roasted at 325°F until done. Stuff the turkey just before putting it in the oven (do not stuff it earlier). 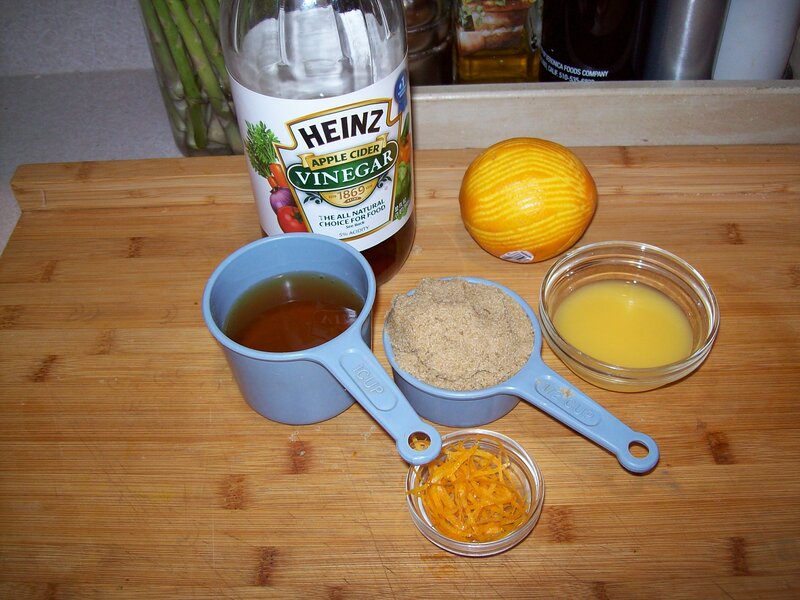 Spoon the dressing loosely into the body and neck cavities. Do not overfill, as the dressing will expand during roasting. Truss the turkey (see related tip at left). To facilitate removing the stuffing, first line the inside of the cavity with a double layer of cheesecloth, allowing it to extend beyond the cavity by a few inches. Then spoon the stuffing inside. After roasting the bird, gently pull the overhanging cheesecloth and the stuffing will slip out easily, neatly tucked inside the cheesecloth. To ensure that a stuffed turkey cooks evenly, roast the bird slowly, breast side up, at 325°F, covering the breast loosely with foil for the first two-thirds of the roasting time. Using the chart above, add about 30 minutes to the total cooking time for stuffed birds weighing 16 lb. or less, and about 1 hour for birds weighing more than 16 lb. 1. After taking the turkey out of the oven, let it rest for 20 to 30 minutes. This allows time for some of the juices to be absorbed back into the meat, which makes it easier to carve and more moist. 2. 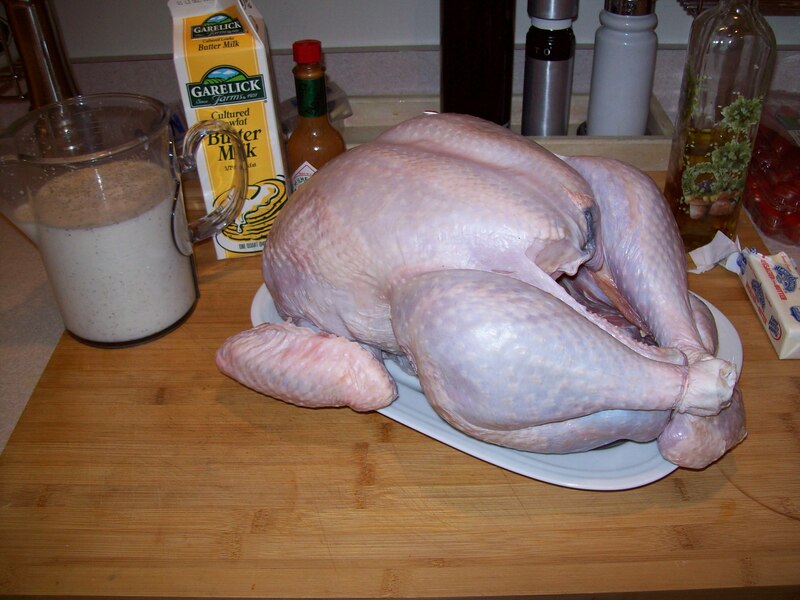 If roasting a stuffed bird, remove all of the stuffing at serving time. 3. After dinner, remove any remaining meat from the bones and refrigerate the leftovers. Again Lyn loves the white meat and I love Lyn so when we saw this nice little boneless turkey breast at Whole Foods we grabbed it. I made a quick brine or smoked seat salt, some natural sugar that Lyn had in pantry and water let it sit for a few hours – I just guessed at this part. Dried it off and browned all sides under Sautee setting. I’m still getting used to it but I don’t like this setting don’t think it gets hot enough but you do get those brown bits on the bottom of the pan. Remember is browning something make sure it has been patted dry or you’ll lower the temperature of the pan or just steam it. I put the steam rake in and added a cup of broth then put the breast in. Sealed it and pushed the poultry button. ( Sorry I can’t remember if I added the time or not. It came out pretty moist, tender and have to admit pretty good in fact I have some diced in my salad today. 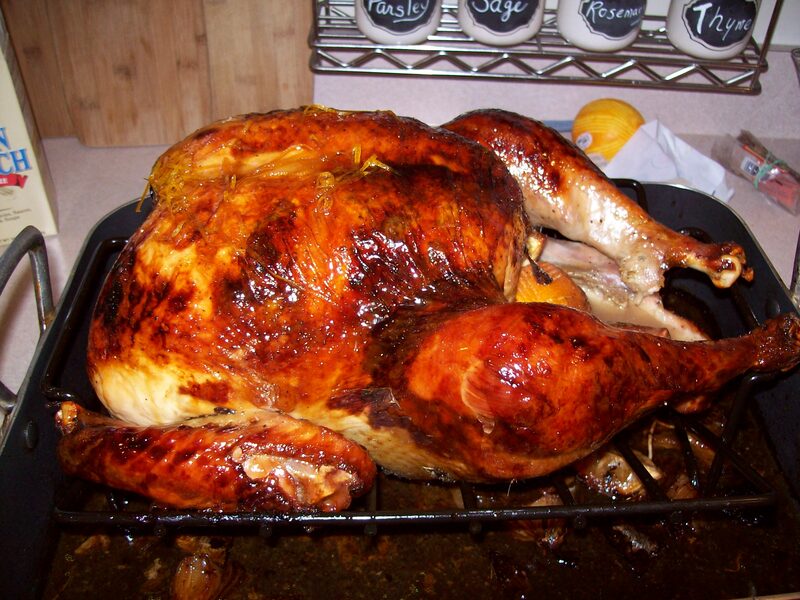 I used the buttermilk turkey marinade method, then stuffed it with lemon, oranges garlic and onions and roasted and then brushed on this nice glaze to get not only flavor but that great caramelized color. Make a head gravy is always a must make that last minute prep so much easier. In a small saucepan, bring vinegar, brown sugar, and orange juice to a boil over high, stirring occasionally. 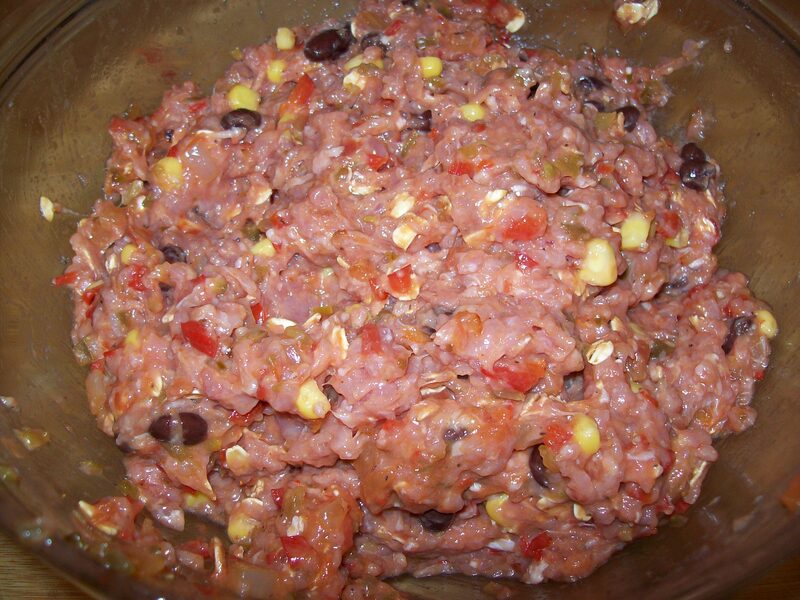 Reduce heat and simmer, stirring occasionally, until mixture is syrupy, about 10 minutes. Remove from heat and whisk in 2 tablespoons butter and orange zest. Use this to baste the turkey once it reaches 125 degree every 15 minutes until done. Tent with tinfoil if gets too browned. Preheat oven to 350 degrees. 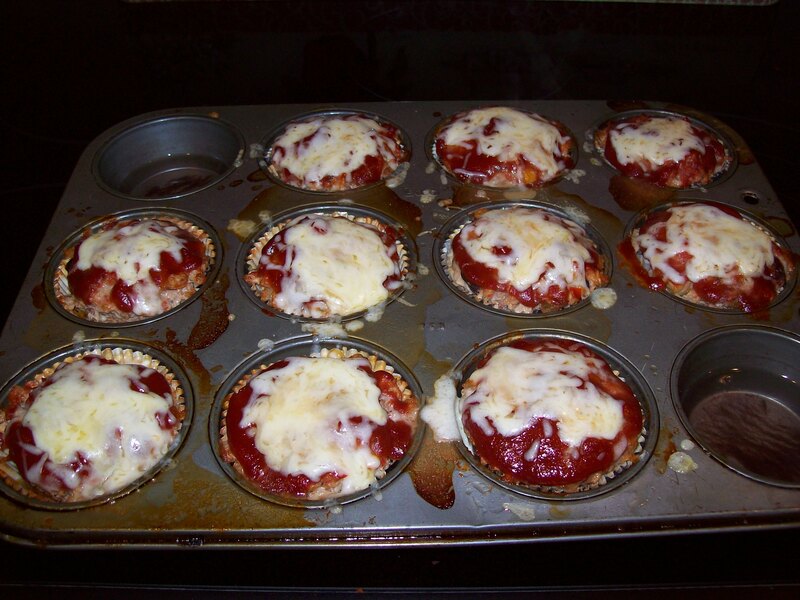 Line 10 cups of a 12-cup muffin pan with foil baking cups, or spray them with nonstick spray. Bring a skillet sprayed with nonstick spray to medium heat. 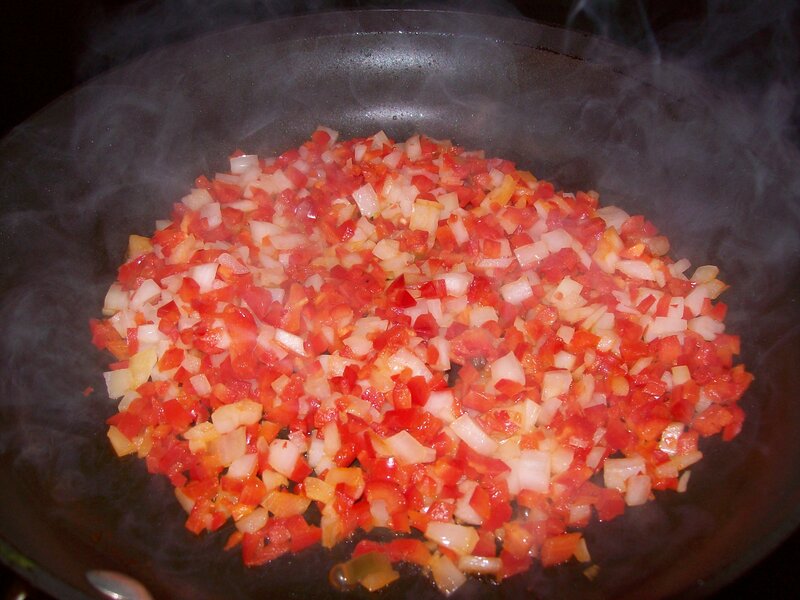 Cook and stir bell pepper and onion until softened and lightly browned, 5 – 7 minutes. Transfer cooked veggies to a large bowl. 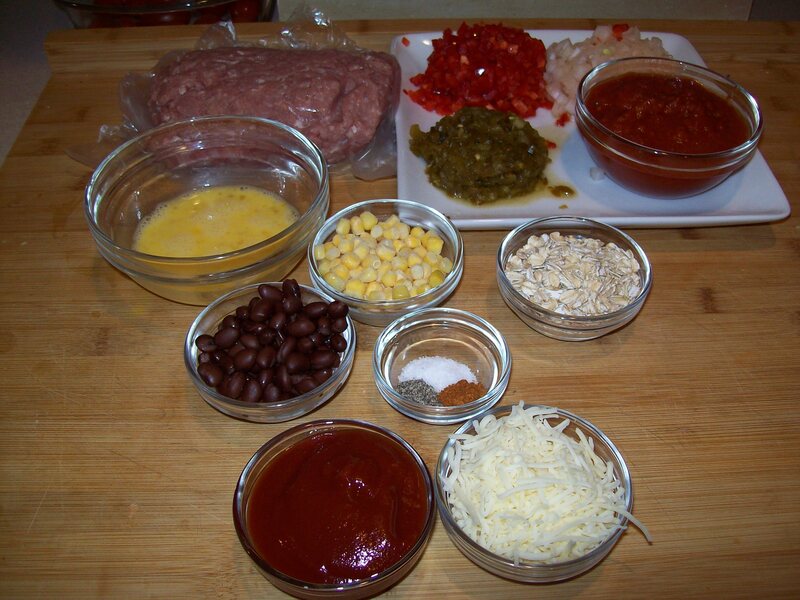 Add all remaining ingredients except ketchup and cheese. Mix thoroughly. Evenly distribute mixture among the 10 lined or sprayed cups of the muffin pan. 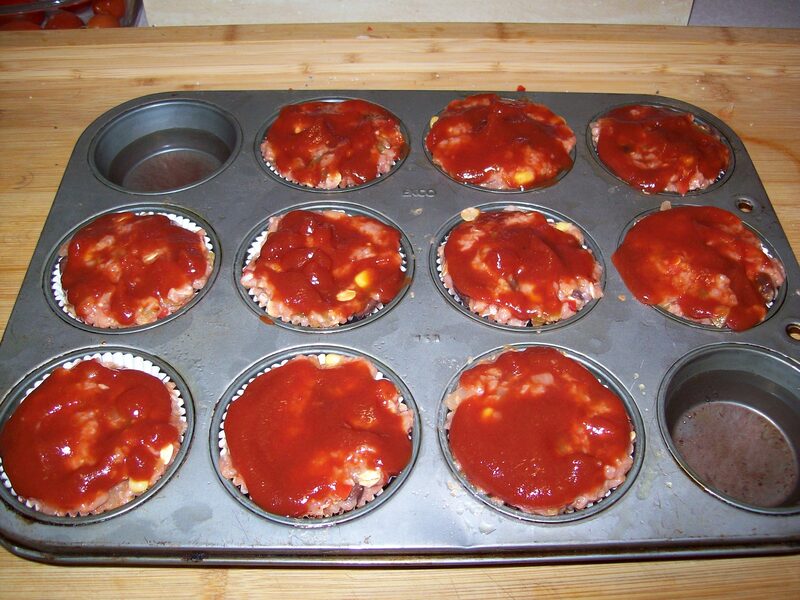 Evenly top with ketchup, about 1 tsp. each. Bake until firm and cooked through with lightly browned edges, about 35 minutes. 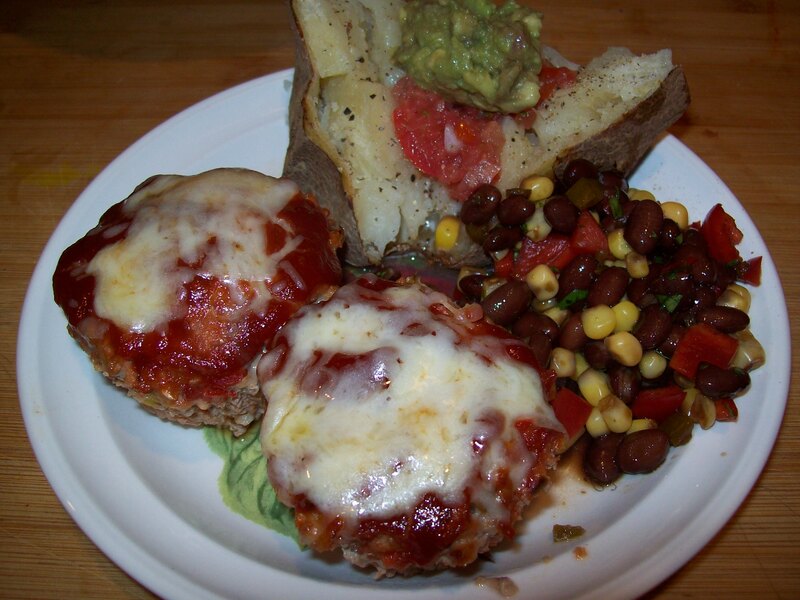 Sprinkle meatloaves with cheese. Bake until cheese has melted, about 2 minutes.